Since 1951, The Kickoff has earned recognition as being one of the most accurate prognosticators in college football because of the way we do business. This is our story. Our newsletter is produced from Chattanooga, Tennessee. It started as a printed publication distributed mainly through pro athletes and coaches with whom our company enjoyed a networking relationship. Over the years, it evolved into a sophisticated mail house operation focusing on the fulfillment side of direct mail advertising. Corporate sponsorships allow companies to send a version of The Kickoff that is branded with their logo to their customers (or prospects) for the advertising opportunities. Individual college football fans also subscribe to our newsletter for a wealth of information, including all major college schedules, complete conference schedules, relevant statistics for each FBS game in the upcoming week, our Top 25 rankings and predictions for the coming games. With the Internet becoming ubiquitous, The Kickoff has updated our product to stay fresh and relevant, delivering our newsletter in various formats for the convenience of our readers. Our PDF version offers the fastest delivery and the ability to enlarge the text for easier browsing. We are excited to bring it to you in new ways. 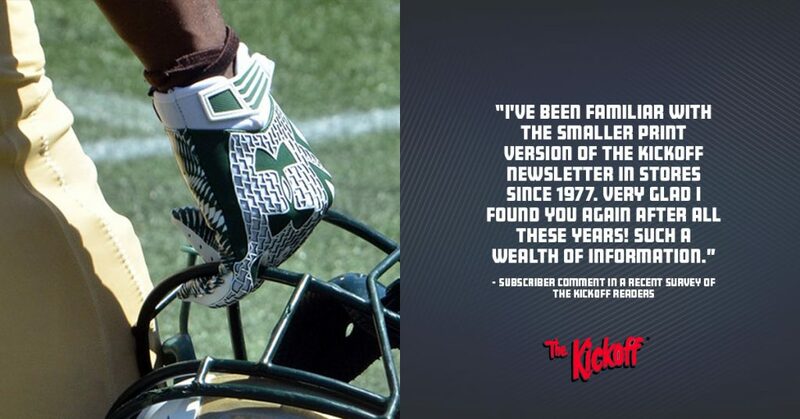 One thing that HASN’T changed since The Kickoff began covering the sport 65 years ago is the loyalty of our customers. Many of them have been with us for a long, long time. We recognize there are more places than ever to get information about college football, but we trust that you stick with The Kickoff because of our easy working relationship and the accuracy of our power ratings. Just like you, we’re driven by a passion for the sport of college football. Every year, we see it bring people together, bridge generations and foster pride among fans and alums. We can’t even imagine how empty autumn would feel without Saturdays spent tailgating and watching games. The Kickoff is our way of celebrating this tradition. We thank everyone for your enthusiasm and look forward to bringing you insight into this wonderful sport for many years to come.